Photo Credit: Isaiah Tanenbaum Joshua H. Cohen is a playwright, composer, and lyricist who's work received a Jonathan Larson Grant and has been nominated for multiple awards. His newest play, The Thirteenth Commandment, a semifinalist for the Princess Grace and Playwrights First Awards, is being presented by Libra Theater Company through May 5 at The Bridge Theater at Shelter Studios in NYC (244 West 54th Street, 12th Floor, between Broadway & 8th Avenue). Click here for tickets! The Thirteenth Commandment is a provocative, real-time drama, in which Jason — a popular high school teacher — tries to provoke intelligent debate among his sleepy 11th grade class by presenting "evidence" that the Holocaust didn’t happen. But when the press gets wind of Jason’s controversial lesson, sharp battle lines are drawn at his small ski-resort town high school, putting jobs and reputations in jeopardy. For more on Joshua be sure to visit http://www.joshuahcohen.com! 1. Who or what inspired you to become a playwright/composer/lyricist? I saw The Fantasticks at the Sullivan Street Theater at the age of 5, and I was hooked. I knew that this was what I wanted to do. Three decades later, I still have the same poor-theater, unit-set aesthetic, and I've been amazed at the physical production Libra has put together on a minimal budget. 2. Who would you like to work with that you haven't yet? Anybody whose name is big enough to sell tickets? Does that sound too mercenary? When I was in American Lyric Theater's Composer-Librettist Development Program, a classmate and I were kicking around the idea of an opera about the fall of Eliot Spitzer. I haven't had a chance to work with her on a full-length piece, but I wouldn't mind returning to that collaboration someday. 3. 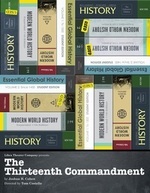 What made you want to write The Thirteenth Commandment? The play began life as a reaction against the disturbing prevalence of wishful thinking in our political discourse -- on climate change, evolution, reproductive issues, etc. -- and when I get mad, I write a play. I wanted to explore the consequences when we choose to believe what we should know to be false, because it makes the world how we want it to look. I settled on the most infuriating, self-evidently evil example of ideologically convenient truth-twisting I could think of: Holocaust denial. 4. What do you hope audiences come away with after seeing the play? This play delves deep into some moral gray areas. It asks audiences to sympathize with an apparent Holocaust denier, to agree with him as he spouts some high-minded ideals about the value of education. As I wrote it, I was forced to examine my own spotty relationship with the truth. Where have I ignored what I knew to be so, to produce a desired outcome? Conversely, where have I remained silent in the face of others' falsehoods? The Thirteenth Commandment invites the audience to ask those questions of themselves. 5. What made you want Libra Theater Company to produce your show and what do you feel Libra Theater Company gives you that another theatre company would not? Libra has graciously taken an interest in my work since their founding. They've included my work in their Songs You Should Know series and in an evening of one-act musicals, and they did a spectacular job producing my song cycle The Entropy Songs in 2011. When they offered to take on this play, I naturally jumped at the chance. In addition to their high standards of work, they remained true to their mission throughout this process. They've made it unusually easy for me to meet the demands of my day job and my home life (my wife and I are about to close on a co-op, godwilling) while still devoting myself fully to the process of rewriting and rehearsing this play. 6. What's your favorite part of the creative process in putting a show together? I love working with actors. I have never understood playwrights who complain about actors. If you don't want middlemen interpreting your work for your audience, write prose. Good actors -- the smart ones, the ones who seek to understand their characters, the ones who ask questions and don't go away till they get an answer -- have a profound impact on the development of a new play. That moment when you realize your play was touching a nerve you didn't even know was there, because the actor exposes it -- that's heaven. 7. You have received much acclaim for your work over the years. What does this recognition mean to you? These things are all relative, aren't they? I've gotten a couple of nice awards, and a fistful of almost-awards, but I still feel like I'm outside the city walls, waving my arms to get the gatekeepers to notice me. Or hoping to knock down the wall by throwing eggs at it. I still have a large pile of plays and musicals that have been praised, and had their fair share of readings and workshops, that are sitting in a drawer waiting for their next step toward an actual production. I once had the opportunity to chat with a bookwriter who had recently won the Kleban Award -- I probably shouldn't name names, but I will say that she wrote one of the only truly funny musical comedy books I've ever seen -- and I asked her if she felt that winning the Kleban (which provides a decent salary for 2 years) had gotten her through the gates and on her way to a truly respectable career in musical theater. She looked at me like I had just sprouted an extra head. What I'm saying is, it's hard out there. 8. What you have learned about yourself from being a playwright/composer/lyricist? That I should have practiced the piano when I was a kid. Seriously, most of my writer friends who are actually making a living in the theater are doing so as pianists/musical directors, and that skill is beyond me. That said, thanks to the monthly workout show at Indian Road Cafe (No Name Presents The Uptown Cabaret), I've gotten a lot better at performing my own work. In terms of learning something deeper about myself... I kind of think I've outgrown the navel-gazing, inward-looking work I did in high school and college. The fact is, I'm not that interesting. I hope in the process of writing to learn something about the world, not myself. The best theater -- the best art of any kind, really -- looks outward, tries to say something true about the universe in which we find ourselves. 9. What is the best advice you've ever received? When Winnie Holzman, the bookwriter of Wicked, spoke to my NYU class, she said this about taking suggestions from audiences and fellow artists: You're at a party. One person tells you to drink some coffee. Another person tells you to drink some water. Another person tells you to take a walk around the block. Another person tells you to go lie down. Another person offers to walk you home. Another person offers to call you a cab. It doesn't necessarily mean you should do any of those things -- but it does mean you're drunk. 10. If you could have any super power, which one would you choose? Will Eno once answered this question, "The former Soviet Union." So I guess I'll answer, the power to shamelessly steal other people's jokes. Joshua H. Cohen’s honors include a Jonathan Larson Grant, the Anna Zornio Children’s Theatre Playwriting Award for his lyrics to Keep On Walkin’ (upcoming production, Amas), and a MAC Award nomination for his cult cabaret hit The Sacrifice of Love (a.k.a. the waxing song). The musical Tamar of the River will premiere this fall with Prospect Theater Company; New York Theatre Barn and Choral Chameleon produced an oratorio version. His songs have been heard at the Duplex, No Name Presents the Uptown Cabaret, and the Laurie Beechman, including Libra’s revival of his cycle The Entropy Songs. Other work includes the play Fun and Games (multiple NYC readings/workshops), the musical Ordinary Island (workshops, WKU/Before Broadway and Momentum Rep), and one-act Odysseus Swims For It (publication, Smith and Kraus). Member, Dramatists Guild; 2008-10 Fellow, American Lyric Theatre's Composer-Librettist Development Program; August 2012 CAP21 Writers Residency. BA: Amherst College, MFA: NYU-GMTWP.